The Program on Goodreads here. If you're going to read one book this year, this is the book!!! I'm not sure I can write a review that will do justice to the brilliance that Young has created with The Program. I experienced so many emotions while reading this brilliant title, I would cry in anguish, than I would feel a spark of hope, only to feel helpless all over again. It's hard not to sympathize with the characters of Young's society, I found myself feeling depressed through much of this book, but that's only because I became so invested with the story and its characters. The theme of The Program is so prevalent to issues plaguing society right now (i.e. teen suicide). You can understand the desolate attitude of Sloane and James, their friends and classmates are all taking their lives, but no one is able to properly mourn the loss of their loved ones, for fear of being mistaken for "Depressed" and sent to The Program to be "cured". 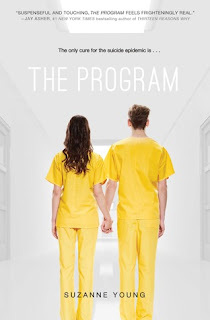 The Program is broken up into three separate sections/books, and each section is just as good as the next, I loved experiencing this world through Sloane's perspective. She's so smart and mentally strong (as ironic as that may be, considering), and makes for the perfect heroine. While there isn't much action, the story and character-building are done so brilliantly, that you won't feel at a loss without it. The plot moves fast through each book and you'll be rooting for Sloane and James throughout. The romance in this story was perfect for die-hard Romantics (like me :)). The connection that Sloane and James share is literally unbreakable, and I loved experiencing and re-expriencing special moments with these two (it's so hard not to be spoilery about this!). I will warn you all though, there is a spark of love triangle in this series, and I actually wouldn't mind seeing this spark turn into a bit of flame. The epilogue is amazing and completely puzzled me. I actually had to re-read it about 5 times before I FINALLY understood the meaning behind it. I cried and sighed through much of this book and can't wait to get myself a finished copy because I know I will be re-reading it over and over. I can't wait for book #2. You have to read this book, no matter what genre of YA you prefer. Oh wow, I definitely have to read this. Glad you enjoyed it so much! I'm so glad you liked this. Ever since I first saw it I've loved the idea of it. I'm excited that the author was able to make the book as awesome as the description sounded. It's such a great read, it really makes the reader think, but is very entertaining at the same time. Loved it! Haha, thanks for stopping by Janeal! I've heard mixed things about this one, but it's hard to argue with "If you're going to read one book this year, this is the book!!!" I will definitely be picking up a copy. This book sounds a bit like Delirium but I'm still really excited for it! I keep hearing great reviews on this one! You got me even more excited to read it. Will push it up my list! Thanks for your honest thoughts! I have been wanting to read this book for a while now and your review made me bring it up on my TBR list. Thank you! I heard about this book before but wasn't sure about reading it. But now, I will give this one shot. You've made me want to read it. Thanks for the review! Such a good book! The epilogue was really interesting though - what do you understand of it? Did it mean that the center could be a Rebel base? Or that the whole interaction is part of the Program?